I know it’s January and many of you are probably deep into your New Year’s resolution to eat better. But it’s also citrus season and the lemons from my sister’s tree are huge and plentiful. And I’ve been dying to share this recipe since November when we made it for Thanksgiving dessert. So, I’ll just apologize upfront for tempting anyone away from their healthy eating. Now, let’s talk about cheesecakes. For the last several years at Thanksgiving, we host a large family gathering for dinner and a friendly competition for dessert. Each year, we try to find the best recipe for a particular dessert item. We have had taste-offs for pumpkin pies, cherry pies, apple pies, chocolate chip cookies, and chocolate pudding to name a few. After doing this for 7 years, we started to run out of good ideas for our annual taste-offs. So, we decided to change the taste-off to more of a tasting this year. We decided to choose a broad dessert category and make several flavors of it – a tasting flight for desserts. We decided on cheesecake and made 6 different flavors ranging from plain, New York style to chocolate caramel. They were all good (it’s cheesecake, after all) but this lemon curd marbled cheesecake was the clear favorite for everyone. The lemon curd doesn’t just sit on top. 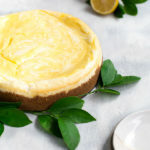 It gets layered and swirled into the cheesecake, amplifying the lemon flavor in every bite. Like any cheesecake, the biggest challenge is baking this cheesecake without cracks forming on the top. This recipe seems especially susceptible to cracking. My theory is the different densities of the lemon curd and the cheesecake batter just make cracks form. So, I’ve decided not to get too stressed out about the cracks because the flavor and texture of this cheesecake are the real winners. And the marbling is plenty pretty to look at. Whisk together the lemon zest, juice, sugar, and eggs in a medium saucepan. Add butter and cook over moderately low heat, whisking frequently, until curd is thick enough to hold whisk marks, about 6 minutes. Strain lemon curd through a fine-mesh sieve into a wide shallow dish, scraping bottom of sieve with a spatula into the dish. Cover the surface of the lemon curd with wax paper to prevent a skin from forming. Cool completely, stirring occasionally, about 30 minutes. Heat oven to 350 degrees. Stir together the graham cracker crumbs, sugar, and salt. Add the butter and stir together until the butter is evenly mixed in. Press the crumb mixture onto the bottom and 1 inch up the side of a springform pan. Bake the crust for 10 minutes, then cool crust completely in the pan on a rack. Beat together the cream cheese and sugar in a bowl with an electric mixer at medium speed until smooth, 1 to 2 minutes. Reduce speed to low and add eggs 1 at a time, beating until incorporated. Beat in sour cream and vanilla until combined. Pour 2/3 of cream cheese filling into cooled crust, then spoon 2/3 of lemon curd over filling and swirl curd into filling with a small knife. (Avoid touching crust with knife to prevent crumbs from getting into filling.) Repeat with remaining filling and curd. Bake cheesecake until set 1 1/2 inches from edge but center jiggles slightly when pan is gently shaken, about 45 minutes. The center of the cake will appear very loose but will continue to set as it cools. Transfer springform pan to a rack and immediately run a knife around top edge of cake to loosen (this will help prevent cracks from forming as the cheesecake cools). Cool completely, about 2 hours, then chill, uncovered, at least 4 hours. Then cover cheesecake with plastic wrap until ready to serve. Remove side of springform pan before serving. these flavors are making me smile just thinking about them. cheesecake is my favorite & yours looks beautiful! Thanks, Jess! Dessert doesn’t get much better than lemon curd and cheesecake, for sure.